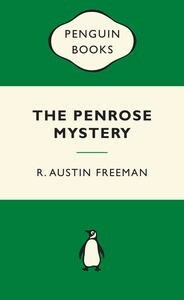 Richard Austin Freeman (1862- 1943) was an English crime- writer. His claim to have invented the crime fiction genre known as ‘inverted’ detective stories – where the commission of the crime, and usually the identity of the perpetrator, is revealed at the beginning, with the plot then focussing on how the detective gets his man – has some substance but is not uncontested. He was prolific, popular and wielded much influence over the crime genre, dominating scientific detective fiction for a good part of the early 20th century. His novels continue to be read by a diminished but loyal audience and have been translated onto stage, screen and radio many times. Austin Freeman was a one-time colonial surgeon and used some of his early experiences in his novels. His most renowned novels feature the medico-legal forensic investigator, Dr John Evelyn Thorndyke. Freeman himself described Thorndyke as a ‘medical-jurispractitioner’: originally trained as a medical doctor, Thorndyke turned to the bar and became, as it would be called today, one of the first forensic scientists. Many of the Thorndyke stories feature genuine if sometimes arcane knowledge from fields as diverse as toxicology, tropical medicine and metallurgy and some experimentation. In his introduction to John Thorndyke’s Cases, Austin Freeman explains that his stories “illustrate…the application to the detection of crime of the ordinary methods of scientific research”. He also says, in a somewhat self-congratulatory tone, “I may add the experiments described have in all cases been performed by me”. The last of five children born to a Soho tailor, Richard Freeman and his wife Ann Maria (nee Dunn), Austin Freeman trained as an apothecary and then studied medicine at Middlesex Hospital Medical College, qualifying as a physician and surgeon in 1887. That same year he married Annie Elizabeth Edwards with whom he had two sons. He entered the Colonial Service as doctor and was posted to the Gold Coast (now Ghana) in West Africa. Invalided out of the Colonial Service following a bout of Blackwater fever (a serious complication of malaria) Austin Freeman returned to London in 1891. Unable to find a permanent job as a doctor in London, Austin Freeman and his family finally settled in Gravesend where he sought to earn money from his writing while also practising as a doctor. His first stories were written in partnership his friend, Dr John James Pitcairn, a medical officer at Holloway Prison, and were published under the pseudonym Clifford Ashdown. The first Thorndyke story, The Red Thumb Mark, was published in 1907 and soon afterwards he began to write his inverted detective stories: some were included in The Singing Bone, a collection of short stories published in 1912. Austin Freeman first experimented with the inverted detective story genre in his 1912 collection of short stories, The Singing Bone: “Some years ago I devised, as an experiment, an inverted detective story in two parts. The first part was a minute and detailed description of a crime, setting forth the antecedents, motives, and all attendant circumstances. The reader had seen the crime committed, knew all about the criminal, and was in possession of all the facts. It would have seemed that there was nothing left to tell, but I calculated that the reader would be so occupied with the crime that he would overlook the evidence. And so it turned out. The second part, which described the investigation of the crime, had to most readers the effect of new matter.” (R Austin Freeman, The Art of the Detective Story, 1924). Freeman’s political views were towards the right. He was virulently anti-immigration, referring to immigrants as ‘sub-man’. In his 1921 book, Social Decay and Regeneration, he claimed mechanisation had created a “homogenized, restless, unionized working class” and had flooded the country with cheap, poor-quality goods. He sympathised with eugenics, was a Council Member of the Eugenics Society and argued that people with “undesirable” biological traits should be prevented from procreating by “segregation, marriage restriction, and sterilization”. Some of his novels and short stories, such as Helen Vardon’s Confessions and The Stolen Ingots have been criticised for racial stereotyping and anti-Semitism. Austin Freeman died in September 1943 in Gravesend. Dr Thorndyke’s Crime File (1941) — omnibus including “Meet Dr Thorndyke” (essay), The Eye of Osiris (novel), “The Art of the Detective Story” (essay), The Mystery of Angelina Frood (novel), “5A King’s Bench Walk” (essay), and Mr. Pottermack’s Oversight (novel). There are in total some 42 short stories featuring Dr John Thorndyke. Thirty-eight were published in the five short story collections mentioned above (John Thorndyke’s Cases; The Singing Bone; Dr Thorndyke’s Casebook; The Puzzle Lock and The Magic Casket. Two other stories featuring John Thorndyke, The Missing Mortgagee and Percival Bland’s Proxy, were published in the collection, The Great Portrait Mystery and other Stories alongside five further stories. There are also two further Thorndyke short stories, neither of which was published during Freeman’s lifetime. 31, New Inn, written about 1905, was later reworked into a full-length novel, The Mystery of 31 New Inn, but was published in short story form in the 1973 collection, The Best Dr Thorndyke Detective Mysteries (edited by E F Bleiler). The final Thorndyke short story, The Dead Hand (which Austin Freeman later reworked into the novel, The Shadow of the Wolf) was published in the collection The Dead Hand and Other Short Stories (edited by Douglas G Greene and Tony Medawar) in 1999 and in Detection By Gaslight, a collection of Victorian detective stories by various authors, in 1997. 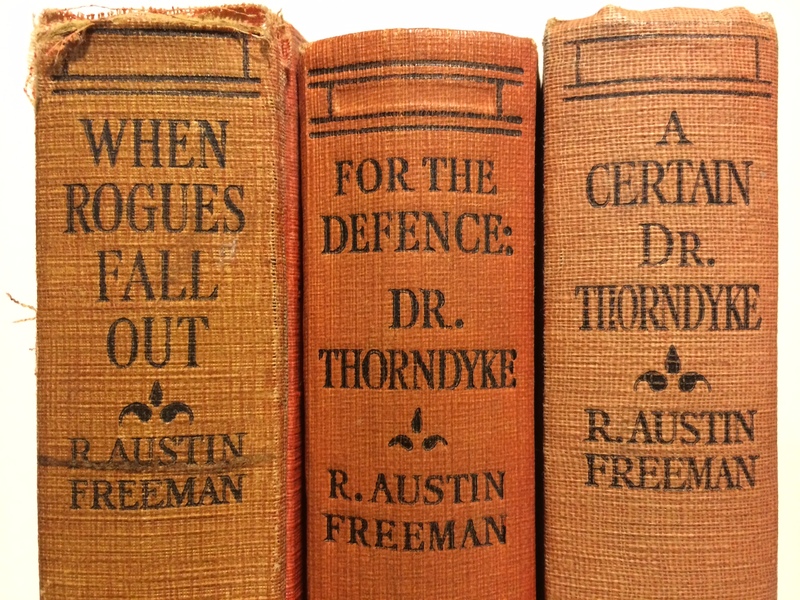 Two omnibus editions of Thorndyke mysteries were published in Freeman’s life time: The Famous Cases of Dr Thorndyke: Thirty-seven of His Criminal Investigations as set down by R Austin Freeman (London: Hodder & Stoughton, 1919) and The Dr Thorndyke Omnibus: Thirty-eight of His Criminal Investigations as set down by R Austin Freeman (New York: Dodd, Mead, 1932). The US edition included one short story, The Mandarin’s Pearl, which was omitted from the earlier UK omnibus. Neither omnibus included The Man with the Nailed Shoes or A Message from the Deep Sea, both of which had been included in the very first Thorndyke short story collection, John Thorndyke’s Cases. Norman Donaldson’s In Search of Dr Thorndyke provides a biography of Freeman and a detailed critical analysis of his oeuvre. David Ian Chapman’s R Austin Freeman: A Bibliography is also indispensable for the collector and reader alike. BookAddiction Book Collector’s Notes are always works in progress and subject to revision. Comments, queries, clarifications, improvement and additions are always welcomed.